vatican Museums - Vatican Buildings, Room of the segnatura. The School of Athens (left) and the dispute over the most holy sacrament (rigt) by Raffaello Sanzio (1483-1520). These frescoes express well the renaissance ideal of the open-minded dialogue inspiring also all of us, both believers and non believers. See a left and right overview of the room of the segnatura. IRAFS was founded in October of 1997, with a Decree of the former Rector, Bishop Angelo Scola - now Cardinal and Archbishop of Milan -, and it is, therefore, the first and oldest Research Area at PUL. IRAFS history can be divided into 3 periods, that, for the sake of simplicity, we denote respectively as IRAFS I, IRAFS II, IRAFS III. For more details, and for an exhaustive sketch of the IRAFS activities during each period, please, select the respective item in the menu on the left. IRAFS'98: Foundations in Mathematics and Biology: Problems, Prospects Interactions, November 26-28, 1998. IRAFS II. From 2004 to 2013: Foundation, coordination (until 2007) and participation in the STOQ, Science, Theology and the Ontological Quest, Project. IRAFS III. Today: in addition to the continuation of the STOQ Project, IRAFS is continuing its activity of research and teaching, according to its new organization chart. We offer here some brief biographical notes of the two main promoters of the Area, Prof. Ennio De Giorgi of the Scuola Normale Superiore di Pisa, who died in 1996, just one year before the foundation of IRAFS, and prof. Edward Nelson, Professor of the Dept. of Mathematics (Fine Hall) at University of Princeton, who recently died on September 2014, and was Scientific Advisor of IRAFS from 1997 to 2003 (see some works published during that period, available online both in his official website at Princeton and in the IRAFS I site). ... as a child I had a special taste for puzzling out solutions to little problems, but I also had a certain passion for experimenting with little gadgets - experiments, if not of physics, of "pre-physics'". After graduating from secondary school in 1946 and obtaining his liceo, he travelled to Rome to enter the University there but, given his interests in gadgets, it was the Faculty of Engineering that he entered with the intention of taking a degree in engineering. Despite his decision of the topic to study, De Giorgi had already discovered while at school the joy of finding proofs of mathematical theorems which were different from those written in the textbooks. This is certainly an early indication of his love of research. In those days the courses of study in mathematics, engineering, and physics were the same for the first two years. It was in that first year that I realized that my natural aptitude was, above all, in mathematics. ... at the Institute for Mathematics in Rome I studied with and received my degree from Professor Picone, who was, as an academic, faithful to the style of those days, that of the so-called "Baron", but who, in discussions of scientific problems, was completely open. I remember that while I was still a student, he said, "Mind that when we speak of scientific problems you are completely free to tell me that I am mistaken, because we are equal in front of science." So he was extremely liberal in scientific dialog but fully respectful of the discipline and the academic customs of the day. For these reasons Picone became one of the great teachers and had many very diverse students, like Fichera, Caccioppoli, and many others, with greatly differing personalities and interests, even in mathematics. Everyone was attracted to Picone because of his accessibility, his interest in all problems, whether those which he personally had studied and resolved or those which interested whoever came to speak with him. Professor and student were indeed an odd match: the former, a classicist, dressed with rigour and elegance; the latter, unorthodox, already wearing his strange beret. But M Picone, a seasoned observer of the development of science, knew how to spot talent; he soon acknowledged E De Giorgi's exceptional abilities. The assistant was freed from all constraints and worked as he pleased at his own leisurely but, in the end, frightfully efficient rhythm. 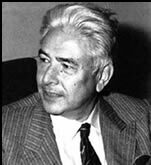 De Giorgi attended lectures by Caccioppoli on geometric measure theory, but already by this time he had his own ideas about how to attack problems of minimal surfaces. Influenced by methods which Caccioppoli had developed, De Giorgi went on to develop new techniques in geometric measure theory and he applied his results to the calculus of variations proving his regularity theorem for almost all minimal surfaces. Nash and I proved the same theorem, or, rather, two theorems very close to each other. From the theorem of Nash one can deduce more or less immediately my theorem, following a quite different line of proof. Thus, from my experiences, the discovery of a theorem can be made by different people, as if it were there waiting for someone to uncover it, and the statement of the theorem is always the same. However, the invented proof can vary greatly according to the mathematician who finds it. For almost forty years, he lived there, taught there, and was a constant source of inspiration for the mathematical school that he founded. Always cheerful, always available, he enjoyed long debates with his students during which he would toss out original ideas and propose conjectures, or sketching the lines of a proof. A full description of De Giorgi's mathematical work is given in  as is a list of his 149 publications. The authors of this paper are all students of De Giorgi and they describe his contributions to geometric measure theory, the solution of Hilbert's XIXth problem in any dimension, the solution of the n-dimensional Plateau problem, the solution of the n-dimensional Bernstein problem, some results on partial differential equations in Gevrey spaces, convergence problems for functionals and operators, free boundary problems, semicontinuity and relaxation problems, minimum problems with free discontinuity set, and motion by mean curvature. De Giorgi received many honours for his outstanding mathematical contributions including the Caccioppoli Prize in 1960, the National Prize of Accademia dei Lincei from the President of the Italian Republic in 1973, and the Wolf Prize from the President of the Israel Republic in 1990. He was also awarded Honoris Causa degrees in Mathematics from the University of Paris in 1983 at a ceremony at the Sorbonne and in Philosophy from the University of Lecce in 1992. He was elected to many academies including: the Accademia dei Lincei, the Accademia Pontifica delle Scienze (Papal Academy), the Academy of Sciences of Turin, the Lombard Institute of Science and Letters, the Académie des Sciences in Paris, and the National Academy of Sciences of the United States. For me the most suggestive indicator is in the Book of Proverbs, one of the most ancient books of the Bible, which at a certain point says that wisdom (which is wider than mathematics) was with God when He created the world and that this wisdom is to be found by men who search for it and adore it. Mathematics is one of the most significant manifestations of the love of wisdom. ... there is the beautiful article (of the declaration of human rights) about the school which recommends not only tolerance but also understanding and friendship between the various nations and the various religious groups. These, comprehension and friendship, are two notions which are often forgotten when one talks of tolerance. Pure and sentimental tolerance is insufficient; only when united with understanding and friendship does it truly allow human activity to progress. In particular, the sciences cannot move forward without understanding and friendship among all scientists. We should recount the way that he put his beliefs into practice. In 1966 Giovanni Prodi asked him to help with teaching at the university in Asmara, the capital of Eritrea, which was run by Italian nuns. He accepted with enthusiasm, and taught there for one month in each year until 1973. From 1988 De Giorgi began to experience health problems. He returned every summer after this to his home town of Lecce, in southern Italy, to be with his brother and sister and their families. In September 1996 he was taken to hospital in Pisa where he died following an operation. L Ambrosio, G Dal Maso, M Forti, M Miranda and S Spagnolo, Ennio De Giorgi (Italian), Boll. Unione Mat. Ital. Sez. B Artic. Ric. Mat. (8) 2 (1) (1999), 3-31. J P Cecconi, Ennio De Giorgi [1928-1996] (Italian), Atti Accad. Ligure Sci. Lett. (5) 54 (1997), 63-67. M Emmer (trs. ), Interview with Ennio De Giorgi, Notices Amer. Math. Soc. 44 (9) (1997), 1097-1101. A Faedo, How Ennio De Giorgi came to the Scuola Normale Superiore (Italian), Ann. Scuola Norm. Sup. Pisa Cl. Sci. (4) 25 (3-4) (1997), 433-434. R Learmonth (trs. ), A conversation with Ennio De Giorgi, Progr. Nonlinear Differential Equations Appl., 1,Partial differential equations and the calculus of variations, Vol. I ( Boston, MA, 1989), ix-xvii. J-L Lions and F Murat, Ennio De Giorgi (1928-1996) (French), Gaz. Math. No. 71 (1997), 30-34. J-L Lions and F Murat, Ennio De Giorgi (1928-1996), Notices Amer. Math. Soc. 44 (9) (1997), 1095-1096. C Sbordone, Ennio De Giorgi [1928-1996] (Italian), Ann. Mat. Pura Appl. (4) 173 (1997), iii-vi. P Villaggio, Ennio De Giorgi (1928-1996), Meccanica 32 (5) (1997), 481-482. Edward Nelson (born May 4, 1932, in Decatur, Georgia, dead September 10, 2014 in Princeton, USA) was a professor in the Mathematics Department at Princeton University. He is known for his work on mathematical physics and mathematical logic. In mathematical logic, he is noted especially for his "internal set theory", and his controversial views on ultrafinitism and the consistency of arithmetic. He has also written on the relationship between religion and mathematics. Nelson received his Ph.D. in 1955 from the University of Chicago, where he worked with Irving Segal. He was a member of the Institute for Advanced Study from 1956–1959. He has held a position at Princeton University from 1959 to the present, attaining the rank of professor there in 1964. Nelson has made contributions to the theory of infinite dimensional group representations, the mathematical treatment of quantum field theory, the use of stochastic processes in quantum mechanics, and the reformulation of probability theory in terms of non-standard analysis. For many years he worked on mathematical physics and probability theory, and still has a residual interest in these fields, particularly in possible extensions of stochastic mechanics to field theory. In 1950, Nelson formulated a popular variant of the four color problem. What is the chromatic number, denoted , of the plane? In more detail, what is the smallest number of colors sufficient for coloring the points of the Euclidean plane in such a way that no two points of the same color are unit distance apart? We know by simple arguments that 4 ≤ χ ≤ 7. The problem was introduced to a wide mathematical audience by Martin Gardner in his October 1960 Mathematical Games column. The chromatic number problem, also now known as the Hadwiger–Nelson problem, was also a favorite of Paul Erdős, who mentioned it frequently in his problems lectures. 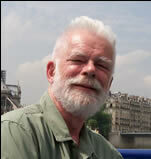 In recent years he has been working on mathematical logic and the foundations of mathematics. One of his goals is to extend IST (Internal Set Theory—a version of a portion of Abraham Robinson's non-standard analysis) in a natural way to include external functions and sets, in a way that provides an external function with specified properties unless there is a finitary obstacle to its existence. Other work centers on fragments of arithmetic, studying the divide between those theories interpretable in Raphael Robinson's Arithmetic and those that are not; computational complexity, including the problem of whether P is equal to NP or not; and automated proof checking. Other informations about Nelson works and life can be found in his official web page at the Dept. of Mathematics of Princeton University. Read the Commemoration of Prof. Nelson life and work at Princeton University. 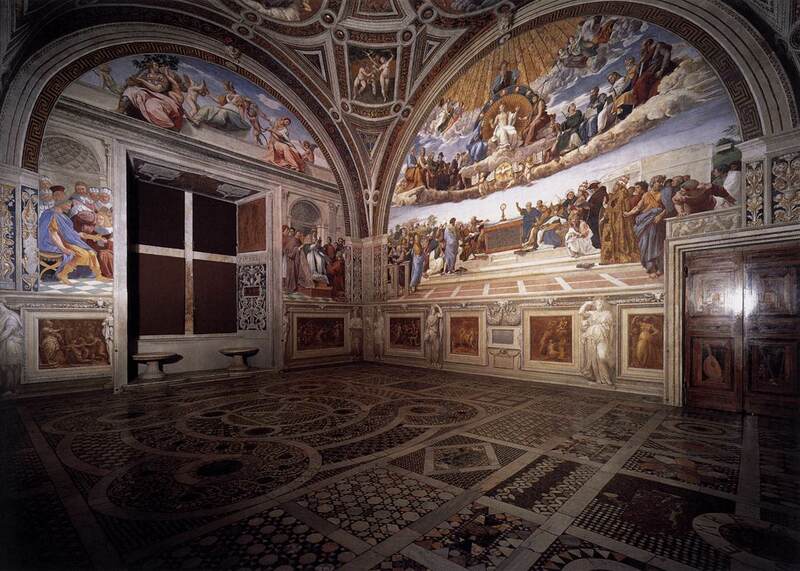 The Room of the Segnatura contains Raphael's most famous frescoes. 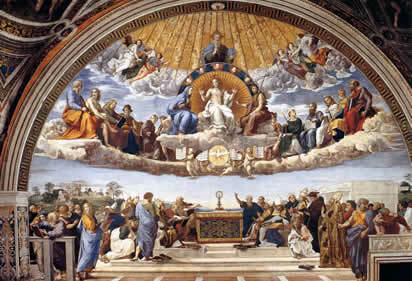 Besides being the first work executed by the great artist in the Vatican they mark the beginning of the high Renaissance. 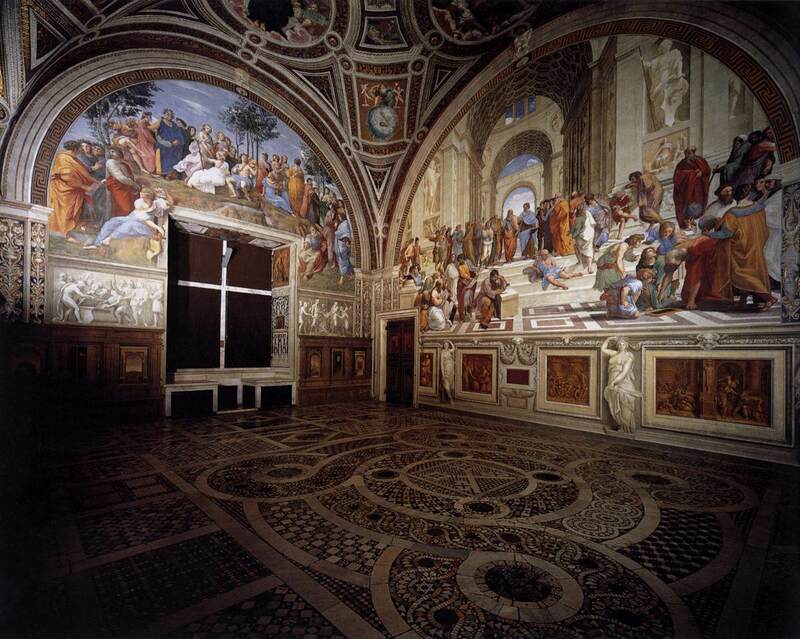 The room takes its name from the highest court of the Holy See, the "Segnatura Gratiae et Iustitiae", which was presided over by the pontiff and used to meet in this room around the middle of the 16th century. Originally the room was used by Julius II (pontiff from 1503 to 1513) as a library and private office. The iconographic programme of the frescoes, which were painted between 1508 and 1511, is related to this function. It was certainly established by a theologian and meant to represent the three greatest categories of the human spirit: Truth, Good and Beauty. 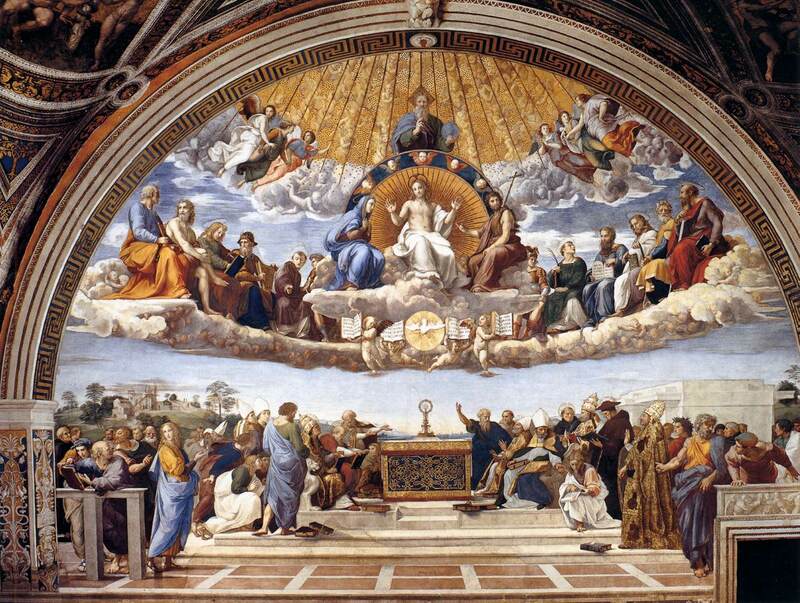 Supernatural Truth is illustrated in the Disputation of the Most Holy Sacrament (theology), while rational Truth is illustrated in the School of Athens (science and philosophy). Good is expressed in the Cardinal and Theological Virtues and the Law. Beauty is represented in the Parnassus with Apollo and the Muses. 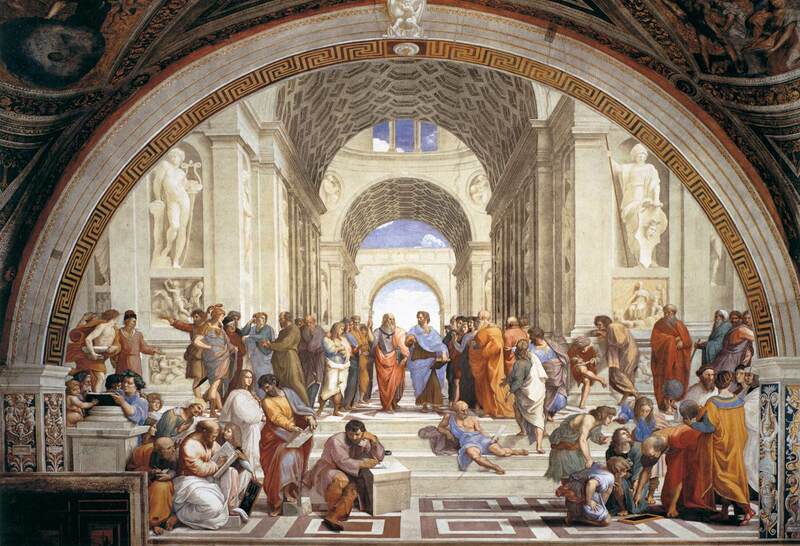 The allegorical figures of Science, Philosophy, Theology, Justice and Poetry allude in fact to the faculties of the spirit painted on the corresponding walls.